I laugh a lot. Mostly because most of what I see is so funny. But let me start off by saying that I realize what I’m writing about is kind of serious…kind of. If you hadn’t noticed, the gay marriage issue is one that is currently boiling over everywhere you look. And it would seem that the battle lines are drawn. Here’s the apparent scene: on one side are gays and those who support gay marriage, and on the other side are the wretched evangelicals. Is this your personal view? I’d implore you to rethink it if it is. The word “evangelical” is becoming synonymous with “hatemonger”, “anti-gay”, and “hopelessly out of touch and therefore worthless”. What’s amazingly tragic is that none of those things should ever be or should have ever been used to describe an evangelical person. Quite the contrary, actually. The word “evangelical” comes from the Greek “euangelion” from which we get our word “gospel”. It literally means “one who brings a joyous message of victory; one who brings good news”. It has at its heart the word “angel” which means “messenger”. The verb tense “euangelizo” commonly referred to a messenger who would precede the king’s arrival into the city, telling of the king’s victory in battle. 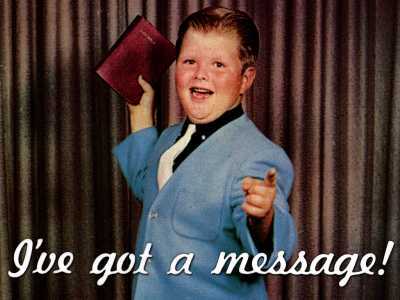 “Evangelical” has always been linked with “good news”. Ask the average person on the street what they think about “evangelicals” and they’re likely to have little to no use for them. To our society, the evangelical movement has proven itself not just archaic, but acidic. We’re not just making noise, we’re making enemies. We’re no longer idyllic, but idiotic. What to do with us pesky evangelicals? Shut them up and then shut them down. And “good riddance to bad rubbish”, as they say. But why? Why are evangelicals considered more and more radioactive when the heart of the Gospel message we carry is that God has heard, that Jesus has come, and that we are reunited with the King? Why does American society have a growing disdain for this good news and the people who carry it? In quick succession, I’d like to share a few of my thoughts and then hear yours. First, too many Christians have not communicated the gospel without spin. If they had, we’d see even more people coming to saving faith in Jesus Christ (even more than the not-too-shabby estimated 80,000 daily who currently do). In America, we’ve taught a shallow gospel, pinned to a dead routine, and wrapped in consumeristic “comfort above all” wishy-washiness. We’ve taught about a Jesus so full of love that He died willingly on a cross in our place in order to be reconciled to us eternally starting right now and in exchange have asked that on Sundays, you should be nice and come to a church building. Unless there’s a game on. Or its race weekend. Or the kids have ball practice. In that case…well…whatever. Secondly, there isn’t good news without bad news first, and its with that point most people struggle. The good news is that Jesus has come, but the bad news is that He came for you because you were lost in your sin. (Want to end a conversation quickly? Throw in the word “sin”.) The good news is that forgiveness is totally free, but the bad news is that’s because there’s no way you could have ever gotten it for yourself. You’re way too sinful, and rendered utterly helpless and hopeless. The good news is that “all who call upon the name of the Lord will be saved.”, but the bad news is that you can only have one Lord, so if He’s it then you’re not. The good news is that the grace of God sets you free in every way a human being can be set free; from condemnation, from the expectations of others, from the power of sin, from your past, present, and future mistakes, from the power of death, and from an eternity separated from Him (to name a few), but the bad news is that we think our version of freedom (doing whatever we want) is just…well…better than God’s version. With our version of freedom, we get to dismiss what’s moral and prop up what we think makes us happy at the moment. We get to live in a seemingly wonderful world where no one is wrong except the people who say something can be wrong. With our version, we get to call ourselves enlightened while ignoring the idea of darkness. Yep, our version is appealing all right…but will ultimately bring about the demise of our society; the one we think so highly of right now. Finally (for now), I’ll throw in a good ‘ol “Catch 22”. Its the argument that “Christians are all hypocrites.” However, look closely and you’ll see that indelibly connected to the human experience is hypocrisy. Its just that its especially nauseating when an evangelical Christian purports to “love God” and yet isn’t perfect all the time. And voila! Its super easy to use my hypocrisy as an excuse to ignore me and my message. Unfortunately, it seems that we have somehow linked the expectation of perpetual personal perfection with following Jesus. I can’t tell you how many people don’t attend church (for example) because they “don’t have their act together.” Somehow evangelicals have communicated to the world around us “Get yourself together, then Jesus will take a look at you.” Geez, I wouldn’t want to be a part of a church like that. I’d feel weird and out of place! But therein lies the very heart of the gospel message. You’re NOT perfect. Neither am I. That’s why Jesus came in the first place. But still we as evangelicals are somehow giving off the vibe that we’ve got something figured out. That we’ve got some corner of the market on God that isn’t accessible to others. Hogwash. The God I love and serve is the God who saved me when I didn’t have one shred of hope to save myself (and I still don’t). The God I love and serve is a God of compassion, grace, and mercy AND a God of righteousness and justice. The God I love and serve is a God of “whosoever”; the gates are flung wide open to ANYONE (straight, gay, white, black, male, female, republican, democrat, tall, short, fat, thin, you get the idea) who would take Him at His word and receive His forgiveness. For the love of the God I love and serve, I have crushed any pedestal I might be tempted to put myself on. I’m painfully aware of my sinfulness and gloriously aware of His willingness to forgive it all and to adopt me into an eternal friendship with Him, one in which as His son I am only who He says I am. And none of this is because there is anything about me that is appealing. None of this is because I’ve figured anything out. None of this because of me, all of this because of Him. Its your turn. What are other reasons that many see “evangelical” as a dirty word? For Evangelicals or simply Christians, being hated by the world seems interwoven within the job description Lk. 6:22 ot 1John 3:13 for starters. We are called to be imitators of Christ and we all know how the world treated him. The bigger problem with the world’s perception of the body of Christ might stem from an overabundance of posers of Christ and not enough true imitators. Don, great use of the word “posers”! I agree! Hey, Jer! I think you hit the nail on the head when you said that we lose our audience the first time we say that anything at all is “wrong.” Society simply does not want to acknowledge the existence of sin because that would mean acknowledging the existence of a standard and that would mean acknowledging the existence of an Authority over us who holds us accountable. Well said, man! Comfort over conviction, right? Thanks for the comment (as always)! When I read “Christians are all hypocrites.” I said to myself “So are all the foxhole bound atheists”.